A few years back, I took a flyer buying stock in a company with what appeared to be pretty good prospects, trading at a low enough price that I was able to buy a large position without investing a tremendous amount of money. That investment didn’t work out very well. As you can see, AVTI has been relegated to the NASDAQ “pink sheets”; the place where stocks with incredibly low share prices go to die. My investment in thousands of shares of AVTI has such a low value, I’d forgotten about it. That is, until one day last week when it dropped so far that Google thought I’d be interested in knowing about its “price change”. Oh, I’m interested, alright. I’m interested in knowing how Google knew I owned shares in this white elephant. 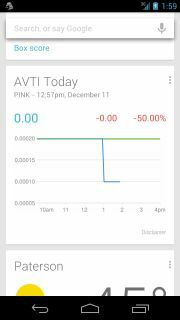 At least that solves the mystery of how Google knew I own shares in AVTI. Now, if they could just tell me what I was thinking when I made that investment. Coming on the heels of yesterday’s piece on whether you can trust Google, this is all the more fascinating. Google has been expanding and improving Google Now, and there are rumors floating about that the way-better-than-Siri ‘virtual assistant‘ is about to become part of the Chrome browser. Now that would be one cool addition to The Chromebook! But it sure was jarring to see that AVTI alert pop up. I may have decided to trust Google a long time ago, but I didn’t realize I trusted them quite that much. Google’s tweaks are getting better and smarter. I’ve mentioned before that privacy, a relatively new construct, is something you probably shouldn’t spend too much time worrying about; the Googles of the world know who you are and there’s not really very much to be done about that. On the other hand, with all that information floating about, you need to manage the way the world sees you. That’s Influency* . And Influency is what we do here. Get ready: Google is getting closer. The only question is how you’re going to handle that.